For a successful search engine optimization it is particularly important to work out a comprehensive strategy based on the right SEO keywords. For this it is necessary to carry out a detailed keyword research and to assign the specific search terms to the single pages. BAVOKO SEO Tools not only supports you in keyword research, but also gives you the possibility to assign SEO keywords to single pages and to optimize their content with the help of automatic SEO optimization suggestions. 1 What is important when choosing the right SEO Keywords? What is important when choosing the right SEO Keywords? There are a lot of factors to consider when assigning SEO keywords. Today, long texts that explain a specific topic completely and in detail, work particularly well for better Google rankings. The aim is to find out which keywords need to be addressed to which extent within the article and how the text should then be structured accordingly. Tip: Put yourself in the position of the user and ask yourself, which answers you would look for, in order to no longer have to ask questions about this topic. It is also important to know that keywords have different priorities within the page depending on relevance, competition and search volume and you should therefore include important keywords in the meta tags and headings, for example. 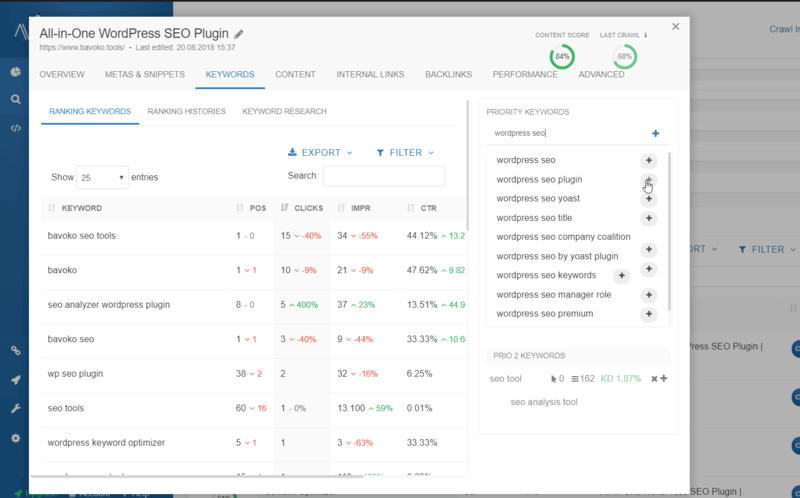 For this reason, with the Priority Keywords System in the PRO version of BAVOKO SEO Tools, we offer you a simple solution to prioritize your most important SEO keywords and to receive SEO optimization suggestions based on this data in the Content Optimizer. To find out which keywords are the most appropriate, it is particularly important to analyze the search volume and the strength of the competition. Since this process is not explained in a few sentences, we will soon publish an additional article on this topic in our blog. As soon as the article is published, we will notify our users via the newsletter. To support you during this process, BAVOKO SEO Tools offers automatic Google Suggestions as you enter the keywords in the Content Optimizer, so you can find and include more important keywords with a single click. Tip: Google Suggest is a powerful tool for identifying proper keywords and topics. We recommend you to take a close look at the results and also enter synonyms or similar keywords to gain a complete impression. 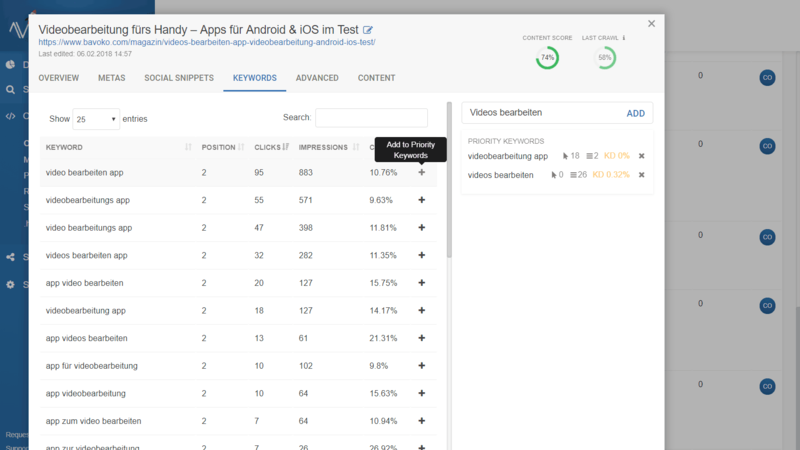 Additionally, within the Content Optimizer you have the possibility to analyze all ranking keywords for the page in the backend by connecting to the Google Search Console, or to execute various keyword search tools with the help of the BAVOKO API, in order to find the best keywords on the topic and to optimize your content effectively. 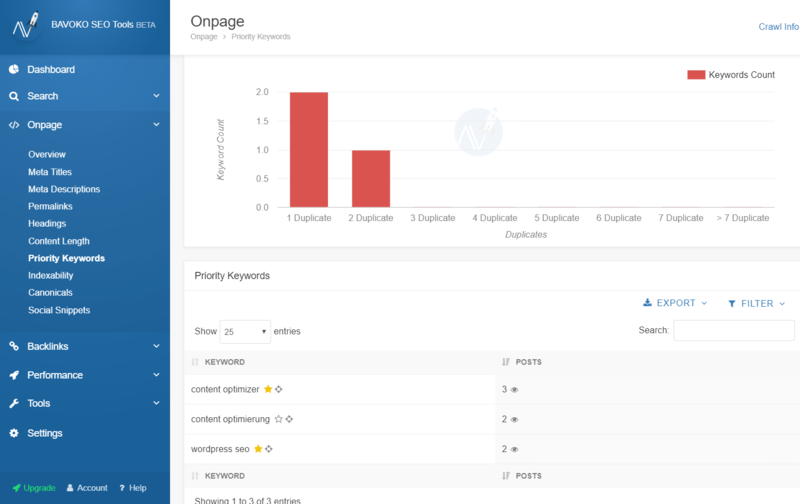 Both within the analysis and on the article pages, you have access to the Content Optimizer, with which you can define the appropriate keywords for the single pages. 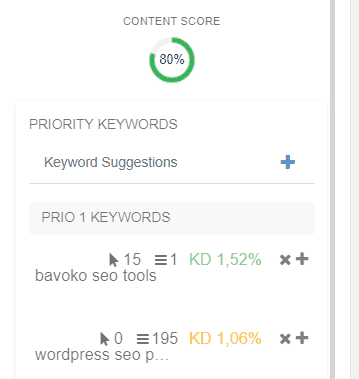 In the Free version of BAVOKO SEO Tools you can define up to two keywords per page, which each are given priority 1 and are treated equally within the SEO optimization suggestions in the Content Optimizer. In BAVOKO SEO Tools PRO you can add up to 25 SEO keywords. In addition to assigning priorities, you can also specify synonyms, abbreviations, or similar spellings (for example, plural/singular) so that they are considered as one search term within the optimization proposals and calculation of the keyword density. Meanwhile Google’s algorithm is so well developed, that it recognizes and can correctly assign synonyms, abbreviations and similar spellings. So if they are keywords with the same meaning, Google will know. Just like in the Free version, you can also add your keywords in BAVOKO SEO Tools PRO using the Content Optimizer and additionally assign the individual search terms to the corresponding priorities and keywords by drag & drop. Add a main keyword using the keyword field in the Content Optimizer. The search term then is displayed at the bottom of the added keywords list. A maximum of three main keywords can be defined for the Prio 1 box, after which the added keywords are automatically assigned to the Prio 2 box. If you want to change the priority of a keyword afterwards, you can simply drag and drop it into the appropriate box. To add subordinate keywords, simply click on the + icon of the main keyword and enter your sub keyword. For better clarity, the sub keywords are always slightly offset within the list. Priority 1 keywords are your most important search terms. These should be used in the title, in the description, in relevant headings, or in the URL and in the best case have at least a keyword density between 1.5% to 3.5%. Priority 2 keywords, on the other hand, should appear often enough in the text as well as in H2 or H3 headings. So use them especially for the important longtail keywords. Within the Content Optimizer of BAVOKO SEO Tools you have several, practical possibilities to add your most important search terms to your SEO keywords with just a few clicks. 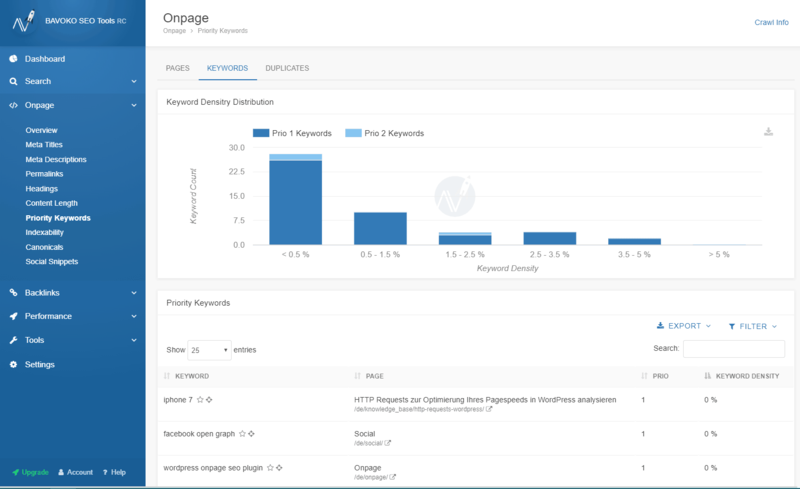 This way you can easily define the priority keywords for single pages during the ranking analysis, which you can define on the single posts and pages via the Content Optimizer, as well as within the various analysis sections of our WordPress SEO plugin. 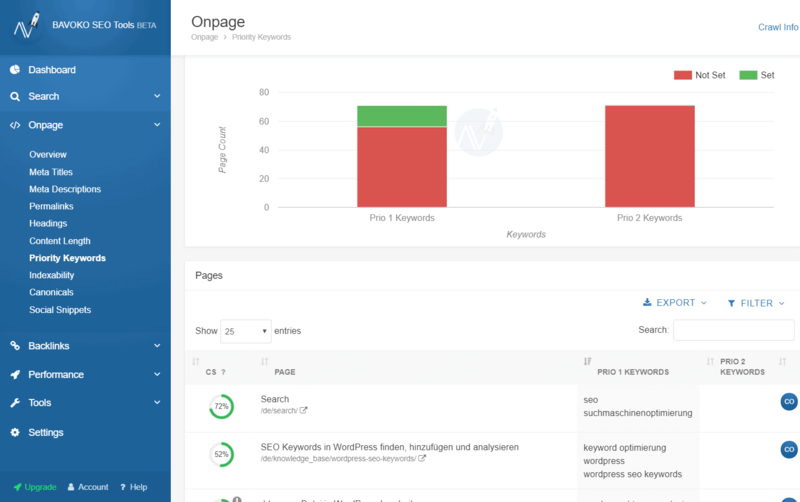 In the Content Optimizer interface, switch to the “Keywords” tab at the top of each of your WordPress posts. Enter the desired keyword in the text field “Keyword Suggestions” and add it to your priority keywords by clicking on ” + “. In the different analysis sections of BAVOKO SEO Tools you can instantly open the Content Optimizer by clicking on the CO icon. Then switch to the “Keywords” menu item. Enter the keyword in the text field “Keyword Suggestions” and add it to your priority keywords by clicking ” + “. Besides the possibility of adding the priority keywords via the text field “Keyword Suggestions”, you can also use BAVOKO SEO Tools to define priority keywords for single pages during the ranking analysis within the Content Optimizer. Click on “Keywords” within the Content Optimizer to view your page rankings. Now add the particularly relevant keywords from the table to your priority keywords with a mouse click on the + icon. You can also assign the respective search terms to your SEO keywords during your keyword research in the Content Optimizer by clicking on the + symbol. After you have found and set your keywords in BAVOKO SEO Tools, the next step is to analyze their progress and rankings. This is necessary in order for you to be able to react as quickly as possible and make changes to your WordPress SEO keywords. 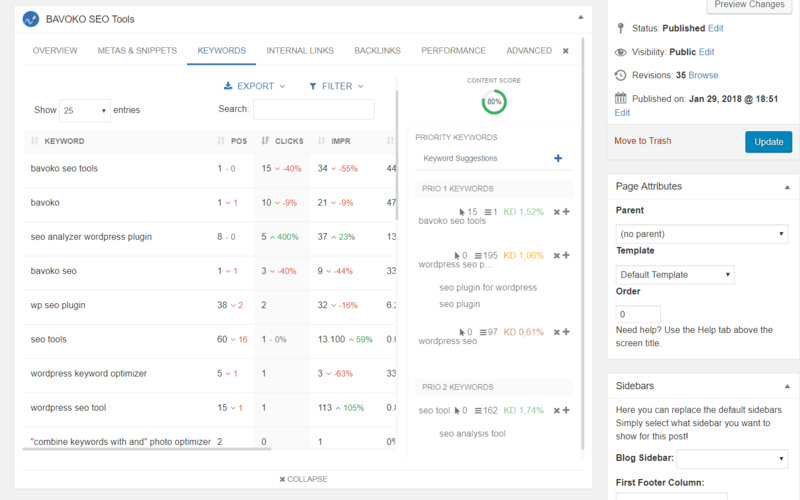 Find out at a glance on which pages no SEO keywords have been set and analyze the individual priority keywords of your pages within the clear table. 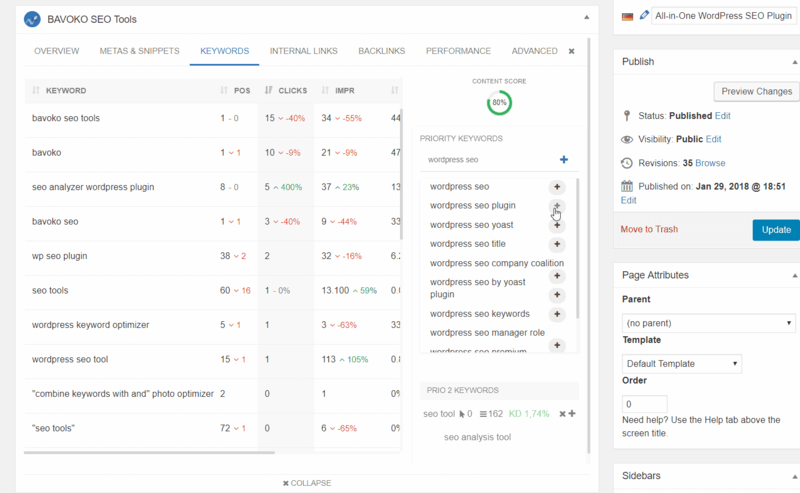 Analyze your SEO keyword density in this view and check the sortable and filterable table for the priority keywords and their density on single pages. If you’re using the same SEO keywords on different pages, you can easily determine the number of duplicates by the graph at the top of the page. The table shows all the keywords on your site, allowing you to easily pinpoint the pages on which the search terms have been set as SEO keywords. To achieve better rankings in the organic searches of the major search engines and to operate a more effective search engine optimization of your WordPress page overall, the appropriate SEO keywords are of utmost importance. 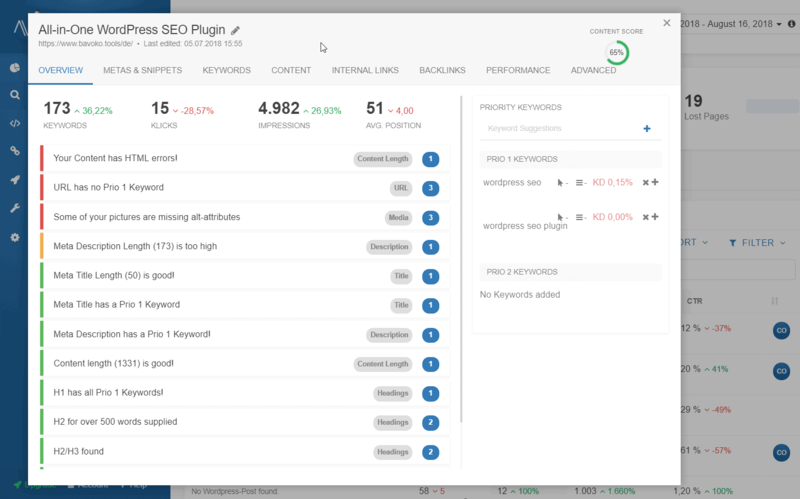 Our WordPress Plugin BAVOKO SEO Tools gives you access to a combination of different SEO tools, with which you can define SEO keywords of your WordPress website without effort and only with a few mouse clicks. Their subsequent monitoring and analysis is also possible in a very short time, thanks to the integrated SEO keyword analyses within the onpage section.